In the future, Earth has joined together to fight the effects of climate change following an increasingly devastating series of natural disasters. The result is an expanded International Space Station manned by dozens of astronaut-scientists overseeing a global network of weather control satellites called “Dutch Boy”, capable of altering temperature, pressure, and atmospheric moisture in order to put an end to things like hurricanes, droughts, floods, tornadoes. The man who designed and built Dutch Boy is Jake Lawson (Gerard Butler), who is fired from the project for being a loose cannon and using the satellites to protect people without authorization. But three years later Jake is called back up to help investigate a series of malfunctions on Dutch Boy: a frozen village in Afghanistan, extreme temperature spikes in Hong Kong, and a mysterious death aboard the space station. Jake hops aboard the next shuttle to space, where his investigation starts to uncover a conspiracy that threatens the entire planet with the possibility of a Geostorm, a global weather catastrophe that could lay waste to the entire world. On its surface, Geostorm is just a stupid disaster movie. It takes an outlandish but still moderately intriguing premise and cranks it up to 11, giving us mindless scenes of computer generated destruction, thin characters that mostly serve to fill in the expected check boxes in a film like this, plenty of wooden acting alongside what are essentially glorified cameos from bigger stars (Ed Harris, Andy Garcia), dialogue that ranges from bland to relentlessly silly, and twists you can see coming from a mile away. That Geostorm had its release date pushed back four times while it underwent extensive reshoots under a new writer and director should in theory tell you everything you need to know. Generally speaking, I would not recommend Geostorm to anyone. So why do I love it so much? Don’t get me wrong, Geostorm is bad. But love is definitely the correct word to describe my feelings about it. 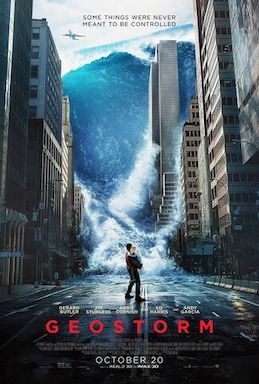 It is one of my favorite movies of the year, and I have an enormous fondness for it, so much so that the soundtrack is now in regular rotation at work and I cashed in some movie rewards points in order to get a Geostorm t-shirt. Part of the movie’s appeal comes from its attitude. Geostorm plays it straight, never giving that knowing wink at the audience that I’m sure some people would prefer. I can’t imagine that those involved thought they were making some award-worthy film, but they don’t let that deter them from giving their all. Geostorm is a movie that tries really hard, something I greatly appreciate, and which makes its failure more endearing. But much of the enjoyment comes from Geostorm’s unintentional hilarity. For a movie about weather, satellites, and space stations, it knows almost nothing about meteorology, space travel, or even basic physics. Some of the more outlandish moments that got me laughing were buildings exploding simply because they’d been struck by lightning enough times or a temperature spike causing gas mains to burst into flames subsequently causing skyscrapers to topple like dominos. My personal favorite moment came after I’d finally just accepted that they would never explain why the International Space Station has gravity, only for two astronauts going on a spacewalk to say “step over the gravity threshold” as though that somehow magically explained everything. But there were a myriad of other joys to be found in the film. When Jake heads to Cape Canaveral to head up to the ISS, we get a shot of how things have changed. The shuttle Jake boards is one of literally hundreds that are just lined up ready to take off, stacked up like used cars at a dealership without enough parking lot space, each on its own crawler ready to go. Villains randomly have rocket launchers in their car trunks, one character escapes a professional hit squad only to be undone when someone pushes him into traffic, and every bulkhead in the ISS has its own hard drive for some reason. The ISS also has an enormous room with a wall-sized communication screen for no reason other than it looks cool. There’s even a random Millennial joke that feels so very out of place and is all the more hilarious because of it. And in case you actually watch the movie and don’t want it spoiled, I won’t give away the ending, but it’s sillier than the heroes in The Core (a movie to which Geostorm is almost a spiritual sequel, but which could never live up to my new favorite bad movie) escaping the center of the earth “through a gap between two plates near Hawaii.” Top it all off with an insanely dramatic “Geostorm Warning” countdown timer that gets far too much screentime in the back half of the film, and my face hurt by the end of the evening from grinning and laughing so much. Writer/Director Dean Devlin made his directorial debut with Geostorm after in the past as a writer and producer alongside Roland Emmerich. Together they wrote the masterpiece Independence Day, along with one of the worst movies I’ve ever seen Independence Day: Resurgence. By standard “so bad, it’s good” math, Resurgence should be a “better” movie than Geostorm because it’s so much worse. Geostorm is bad but it’s generally serviceable. It’s not insultingly bad in the way Resurgence is. Devlin doesn’t show any real talent as a director, and the studio would apparently agree since they didn’t involve him in reshoots, but I can’t deny that he crafted a movie I wholeheartedly enjoyed. I admire his ambition and how he wasn’t content to merely make a disaster movie about a global storm so he could fill it with scenes of people running from airplanes dropping from the sky. No, he combined a disaster movie with a space action flick with a conspiracy thriller topped off with a plot to assassinate the President, that takes itself 100% seriously. It’s as though he told himself, “Well, I’m might only get to direct one film, so I might as hold nothing back!” Most people will probably find Geostorm forgettable and worthy of an eye roll at most. But for the right person (especially if they have a good, like-minded friend alongside), Geostorm is a once-in-a-decade joy to behold. I mean, how often do you get a shootout during a car chase during an electrical storm caused by a conspiracy causing malfunctioning weather satellites controlled by a slowly exploding space station where one lone hero is trying to save the world? This entry was posted in Movie Reviews and tagged climate change, dean devlin, Geostorm, Gerard Butler, Movie Reviews, Movies, nasa, so bad it's good, space, weather by lovepirate77. Bookmark the permalink. I’m gonna give the movie a pass though. Just not my thing. Yeah it’s not something I’d generally recommend except to specific people I know really well who would get a kick out of it.